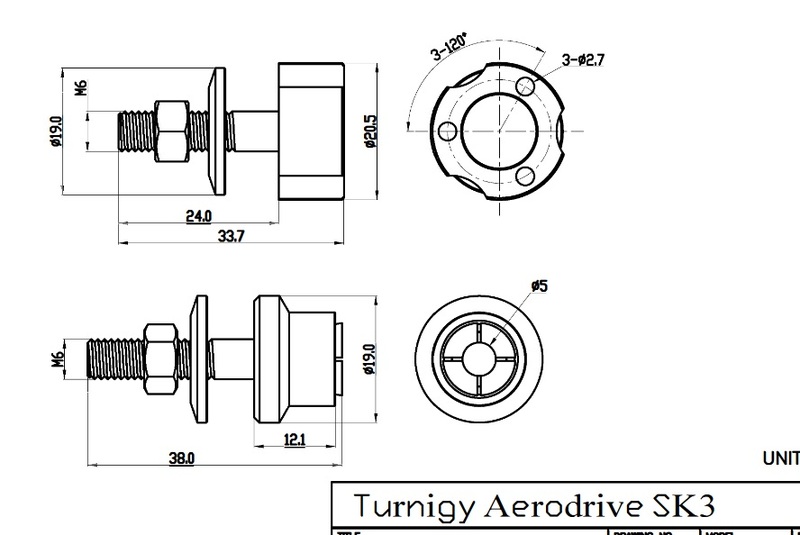 Turnigy 5mm shaft vs. prop mount shaft diameter. Turnigy motors come with a collet prop mount, and it's bigger than the shaft (obviously). I've not owned one with a 5mm shaft before. Does anyone know how big the prop mount shaft is on these? While putting together an order, I'm looking at trying out some of their wooden props, but don't want to have to take up slop in the center hole if it is too big. They are apparently predrilled to 8mm. I don't have the specific model prop adapter that you are looking at but I have two types of 5mm shaft adapters. One (Timber) has an 8mm mounting shaft. The other (amazon special) has a 10mm mounting shaft. You have a link to the part? The motor is the SK3 3542-1000 that I'm planning to put on the Maja. The props in question are the Turnigy Cherry wood 13x5, unknown bore, or the Aerostar Gas/Electric Laminated 12x6 with a 6mm bore. The Turnigy Beech wood appear to be drilled large in the image and people complain of lack of bushings, implying they are overdrilled, so I will pass on those. Can't give you any tips on wooden props - I have never used them. One "tip" when using the HK website, it's always worth looking at the "Files" or "Upload Files" tab - sometimes there is nothing there, and sometimes there are a bunch of docs uploaded by HK or users. In the case of your motor they have tech drawings of the motor and prop adapters. Looks like the prop mount shaft is M6 or 6mm. It's a good tip! I didn't know these drawings were available. Thanks for letting me know. There are even tests with some props for wattage and thrust. Awesome! Edit: Looks like those published test results are going to result in me changing motors to the 1185. Only 35A and 370W swinging a 12x6? I'm going to need more jam. These results show the reason I'm going wood, by the way. The 11x5 Zoar (wooden prop) is delivering almost as much thrust as the 11x7 APCe, yet is drawing 70W less power. Zoar have a pretty good reputation, hopefully the Turnigy are half decent. Hmm, you were right about eCalc and madness. After chasing my tail in circles, I had better stick with the 1000 and just load it down heavier with some pitchier props. It looks like at partial throttle, a 12x8 at 1000kV should actually deliver better thrust per watt than the supposedly better pitch speed of the 12x6. In addition, it pours out the static thrust, will max out that motor and get me above 0.7:1 TWR. And it beats the 13x5.5 in both thrust and efficiency. Huh? Well, at least eCalc has earned my dollar this month. Even if the values don't quite match HK's numbers, maybe they are more relevant than true static numbers. Plastic props are cheap, guess I'm gonna buy a bunch and fly them all, then get a wood in the size that performs the best. It is not the fact it is wooden that gives the same thrust for less power but the drop in pitch, 7 to 5. Just remember static thrust although easy to measure does not equate to the thrust (or power) when at flying speed. For a given power a fine pitch larger diameter prop will give a good take off acceleration but it can end up actually wasting power trying to achieve even a safe flying speed. For a given motor power a fixed pitch prop requires a compromise between pitch and diameter unless of course the plane flies very slowly all the time! Why is the 5 so much more efficient? It seems odd that we have dropped two pitch speeds, yet the RPM very close, thrust nearly the same, and the wattage significantly decreased. eCalc claims that the difference should be 56 to 72 oz of static thrust rather than the 55 to 57 seen on the test stand. Neither gives a warning about blades stalling. The simulated wattage difference is pretty close. It seems like something is throwing off the performance of the 11x7, maybe airflow on the test stand? For this plane, there are two goals - high takeoff thrust and flying efficiently at a fairly constant speed, so I should be able to select a definite optimum prop. At the end of the day, I am willing to sacrifice efficiency for safer takeoff performance. I've ordered a selection of props in both wood and composite, from 12x6 to 13x6. It only cost me $15 and I plan to mount each one, set the autopilot to fly the same pattern, and see what data on performance and efficiency I can gather. Testing is more fun than trying to calculate the best setup, anyways! Given that brushless motors maintain a reasonable efficiency from about 50% power upwards you should be able to obtain a good take off performance using the motors 100% power yet not loose that much overall efficiency when significantly throttling back for cruise. As eCalc can only give static thrust figures finding a good 'flying' solution for your plane does rather come down to 'trial and error' testing. Even props with the same pitch and diameter from different manufactures will give different results, all in the design of the prop..